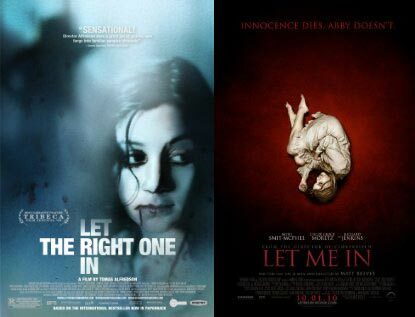 Todays review is a dual review of “Let the Right One In” & “Let Me In.” If you haven’t heard of them, “Let the Right One in” is a Swedish film based on a book of the same title and “Let Me In” is the American remake. I saw “Let the Right One In” a long time ago and I just now got to see it’s remake, which I have to say really surprised me. Being such a fan of the original film, I was really disappointed when I heard there was going to be an American remake. Nothing against America, ( I live there) just remakes are usually a huge disappointment. This movie is the exception. I have to say that I enjoyed this film almost as much as the original. The storyline for both is the same; “Oscar / Owen, an overlooked and bullied boy, finds love and revenge through Eli / Abby, a beautiful but peculiar girl who turns out to be a vampire.” The only real difference there is the names (Swedish / American). There are of course other differences but for the most part the films are very similar. I was really surprised with the ability of the young actors in both films, they really are talented at what they do. That being said I really only saw one difference in the remake that I really didn’t like, and that is the CGI. The visual effects were something terrible, they were too obvious and too cartoonish for me. The last time I saw effects like that was in Exorcist 4, and those effects killed the movie for me. Luckily this movie was good enough that these awful effects didn’t kill it out for me. If you are looking for a “Real” Vampire movie and not another “Twilight” piece of $h**, then this is your movie(s). Both are amazing films and if you like one then you should like the other. They definitely bring back vampires after Twilight ruined them. Vampires should explode in flames when sunlight hits them, not sparkle. These films are true vampire flicks. So for your movie night I highly recommend either film, you will not be disappointed. I only give “Let Me In” 4 stars because of the CGI. If it wasn’t for that it also would received 5 stars.